The white giant beans called “gigantes or elephantes” have been cultivated in Northern Greece (Kastoria, Florina, and Drama etc.,) for centuries and are recognized by the European Union as products of Protected Geographic Indication (PGI). These black giant beans are a new Greek variety and are not widely known in Greek cooking yet. They are rich in antioxidants and as you can see from the package they are rich in proteins and carbohydrates with lots of healthy properies, perfect especially for the period of fasting. On the package there was a recipe, probably Mexican, using corn, not that the recipe wasn’t good but I wanted to cook something really Greek, so I decided to improvise and make my own recipe. I really enjoy creating new recipes as this is the best part of cooking which I love the most. Old traditional dishes like Gigantes Plaki are fine but we just can’t stick to the old recipes and keep recycling the same things over and over again. A few days before I had made a spanakopita in which I used some aromatic herbs. Among them I used kafkalithres (small hartwort) and myronia (shepherd’s needles)” and still had some of these herbs which I wanted to use and had some frozen spinach as well, so I decided to combine them in the recipe. Even if you don’t add these aromatic herbs, the dish will still be delicious as these giant beans had a lovely sweet taste, like chestnuts and while cooking them the smell reminded me of butter. In a lot of Greek recipes with tomato sauces we add pasta in the end to absorb the juices, so at the end I decided to add the pasta as well and it made a fantastic dish. I am sending this recipe to Sowmya, of Creative Saga for her event Cooking with Pasta. Soak beans in plenty of water, overnight. Drain and add fresh water and bring to a boil and remove any froth with a slotted ladle.Cook for about 1 hour, drain them again and set aside. Preheat oven at 200oC / 400oF. Heat olive oil in a saucepan and sauté onions and garlic until translucent. Add spinach and sauté for a few minutes, then add chopped celery, carrots, parsley, kaflalithres, myronia and beans and mix. Add, tomato and tomato paste, salt and pepper and water and mix. Place in a casserole with lid and cook covered for an hour. Add pasta and cook covered for five minutes. Remove the lid and if all the sauce has been absorbed, add 1 cup of water and turn off the heat.Mix it a few times until the water has been absorbed. Tomorrow is the Announciation of the Virgin as well as Greek Independence day, which is a public holiday. It is also my daughter’s name day, so I will be busy cooking for family to celebrate this special day. Kopiaste and Kali Orexi kai Chronia Pollai!! Interesting, black gigantes. Do they taste differently, any differing nutritional value? Yes, as mentioned in the post they have a taste of chestnut and apart of the usual nutritional value of all dried legumes (vitamins, minerals, rich in dietary fibres, calcium etc) these are richer in proteins and carbohydrates. Black gigantes? I wish I could get my hands on them here! They look lovely as does your creation Ivy. I totally agree about cooking and getting creative…that's the best part! A deliciously healthy dish! I love the idea. How gorgeous! I've never seen black gigantes before. I've been on enforced blogging/reading leave, but it's great to "see" you again! Have a Happy Independence Day! I'd love to try this creation of yours, but finding the ingredients may be a trick. Black Beans? We have those. What are the aromatic herbs closest to in the English or American kitchen? Thank you Claudia. About these aromatic herbs, if they are not available you could try using any herbs you like. I would certainly add some fennel fronds or dill or fresh coriander (cilantro) combined with bell peppers. The dish sounds very flavorful! black gigantes is something new to me and never seen or eaten before , thanks for sharing! I shall look out for some black gigantes! The dish sounds very healthy and nutritious! This beans is really new to me , the dish looks really yumm. Very intrigued by the black giant beans and would love to try this delicious pasta dish! I love beans! I would love to try those black giant beans and your dish looks fantastic. Ivy I love your dish! Black gigantes, what a find. When I come to Greece I'll definitely buy some or I'll just ask my mother to send me some. I'm really excited about the possibilities. Do these get sold in the US? I have never seen them; I love black beans they taste so good with chipotle peppers; I would love to try those! I have no idea Joumana. They told me on facebook that they are sold in Australia and if I find out I'll let you know. delicious and very healthy dish! 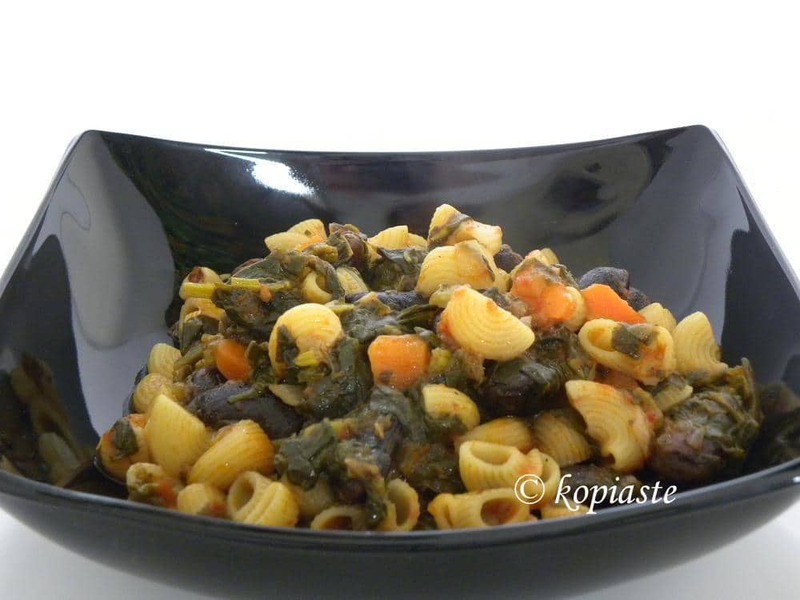 LOL – that pasta reminds me of little snail shells rather than elephants ears. This looks really great Ivy! Very hearty and comforting. And healthy. What an interesting bean! I learn always something from your blog Ivy! I tried your other Gigantes recipe but I used haricot since I could not find those. It was a hit w the family so has since been adding to the list of family favs. I would like to try this but unforunately no black beans like this here? What do you suggest as sub Ivy? Thanks again! where oh where to buy these beans in Oz? I suppose you will have to look for then at store selling Greek food. Hi Ivy! I am cooking black gigantes today and your posting is the only one I could find on the subject. I don’t have the herbs but I’m trying something similar. So glad you had written about these–I had them in the pantry waiting to be cooked… You gave me the inspiration to go for it!